The EJX-A series is Yokogawa's premium performance line of DPharp transmitters. 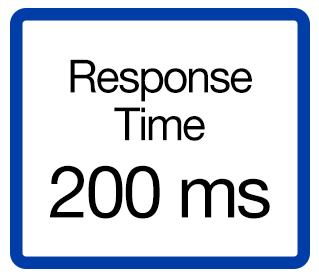 Released in 2004, it offers the performance and stability needed in demanding applications. The EJX-A series performance makes it the thoroughbred of the DPharp family of pressure transmitters. 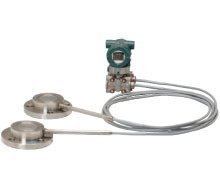 The EJX118A is the Differential Pressure Transmitter with Remote Diaphragm Seals in the series. Explore how the EJX118A can help you Boost your bottom line. Plants run better with Yokogawa differential pressure transmitters. 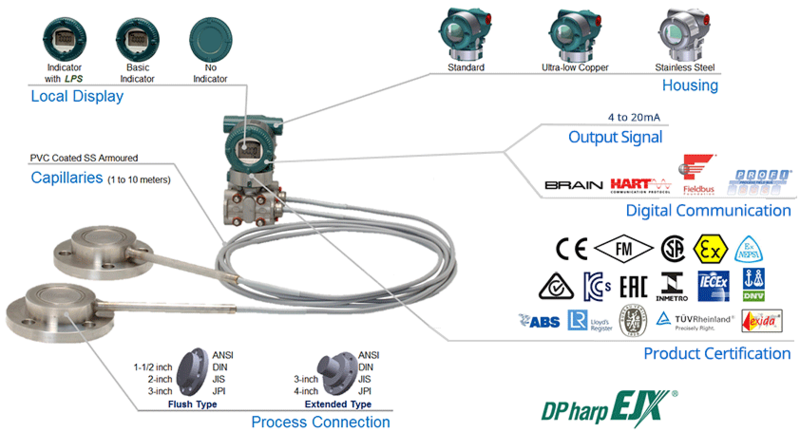 At it's heart, Yokogawa's differential pressure transmitter with DPharp digital sensor offers the performance and device intelligence needed to get greater insight into your process. Yokogawa's DPharp digital sensor offers twice the performance and stability of the competitor's analog sensors. The DPharp uses the latest in IC Chip-style design and manufacturing technology. Analog sensors are based on older design technology. 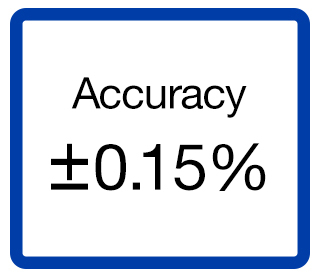 Although analog sensors are good, the modern DPharp sensor out performs them. A Yokogawa transmitter with DPharp digital sensor will give you the consistent, reliable, accurate measurement you need. All remote seal system on the market use fill fluid to 'transmit' the process pressure from the remote diaphragm seal to the pressure sensor in the transmitter. The physical properties of the fill fluid change has process temperature and ambient temperature change causing the transmitter to measure inaccurately. This effect get worse the longer the capillaries are. The key is to filter out this 'noise' to get an accurate, consistent, reliable measurement. Yokogawa has a superior design, manufacturing process, and features to reduce this 'noise'. Signal characterization is a versatile function available on all Yokogawa pressure transmitters. The function is used to compensate the analog 4 to 20 mA output signal for non-linear applications. Such applications include tank strapping or flow measurements; but, it can be used in any application where the relationship between the pressure input and the desired output signal are known. This feature can use up to 10-points. Ruggedly constructed differential pressure transmitter can help your plant reduce failures. Yokogawa's DP transmitters have construction features that are designed to allow it to outlive your plant. Four-bolt pressure retaining design, Active DPharp sensor, and dual seal certified to ANSI/ISA 12.27.01 - all design features to extend the life of the transmitter. All Yokogawa EJX-A series pressure transmitter are designed and certified to IEC61508:2010 Parts 1 through 7 and IEC61511:2004 Parts 1 through 3. They are certified for single transmitter use in SIL 2 rated safety applications and dual transmitter use in SIL 3 rated safety applications with no special option required. With Yokogawa EJX-A transmitters, no longer will you have to maintain two separate inventories - one for production applications and one for safety applications. How much will that save your company? The certificates are available under the "Download" tab above. Routine maintenance is easier with Yokogawa differential pressure transmitters. 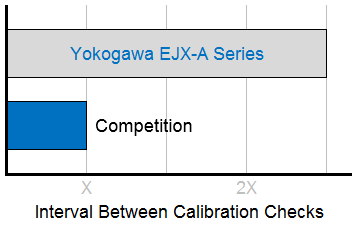 Yokogawa EJX-A series pressure transmitters have a long-term stability under all operational conditions. As you gain experience with these transmitters, you will be able to extend the time between calibration checks. Yokogawa offers several platforms to communicate to your transmitter. FieldMate is a PC based communication platform that can communicate with your transmitter and manage your entire instrument inventory. 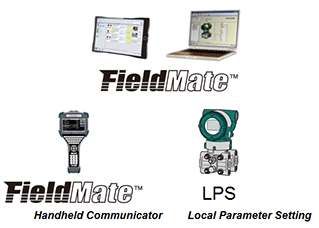 FieldMate HHC is a traditional hand-held platform that allows you to take that information into the field. Forgot your HHC? No problem. The LPS feature on the transmitter allows you to update 9 parameters without the use of an HHC. A flushing ring a round device that is place between the diaphragm seal and the process connection. The device has two 1/4-inch ports that can be used to run a flushing solution across the face the seal to clean it. If you need a different size port, Yokogawa also offers Flushing Rings supplied by a global partner WIKA. Yokogawa manufactures a communicator for your needs. Yokogawa communicators are available for BRAIN Protocol, HART Protocol, FOUNDATION Fieldbus, PROFIBUS PA, ISA100, or Modbus. All out communicators are compatible with Yokogawa products as well as other products on the market. Yokogawa offers a range of loop powered and FOUNDATION Fieldbus remote indicators that can be used to locally monitor data from field instruments installed in difficult to access locations. What is a calibration/flushing ring on remote diaphragm seals?